Laframboise releases “Secret Santa” Intergovernmental Panel on Climate Change (IPCC) internal files that reveal more attempts by agenda-driven activists to skew the science on climate change. In 2012 the UK met weather office revealed no global warming for at least 16 years while IPCC admits global warming predictions were way off and there is no trend in extreme weather. 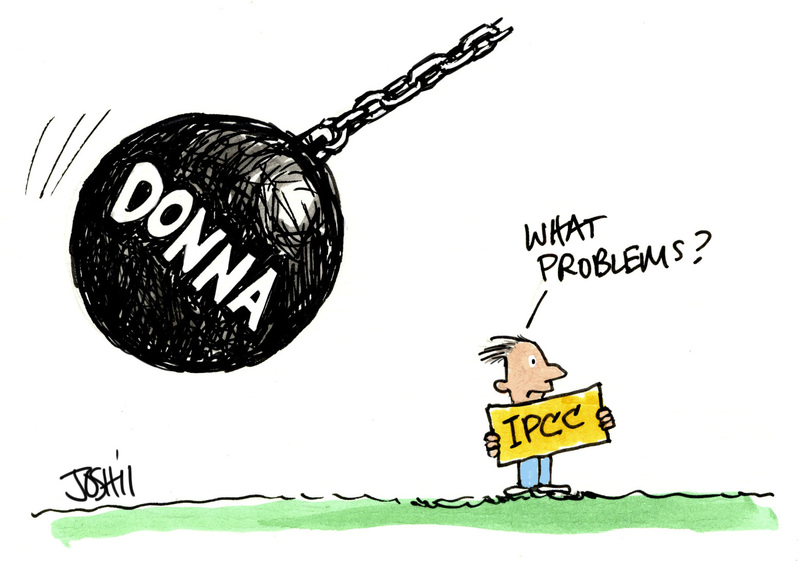 This week 3 USB drives of IPCC internal documents that a “Secret Santa” whistle-blower delivered to investigative journalist Donna Laframboise continue to erode the credibility of the human-caused ‘global warming’ theory. Files reveal that the IPCC agenda-driven activists who have invaded the IPCC continue to advocate the adoption of their ‘climate crisis cult’ propaganda over peer-reviewed science. Prominent scientists have voiced similar concerns. Even so Washington Post climate reporter Stephen Stromberg’s op-ed of November 30, 2012 cited three catastrophic studies (mostly based on computer models) in advance of the Doha COP-18 conference where the Kyoto carbon dioxide emissions reduction accord was to be extended. But two weeks later on December 13, 2012 Alec Rawls leaked 14 draft chapters of the upcoming IPCC report on-line. The Secret Santa leak includes a further 30 chapters and over 33,000 expert reviewer comments. The leaked draft confirmed the catastrophic warming scenarios of the previous IPCC climate models were way off, far too high, by several factors. “And finally, the IPCC admitted and then evaded recognition that the sun is a major factor in climate change,” says Gregory. In their limited commentary on the sun’s role, the IPCC appear to believe the sun’s impact on climate is limited to the powerful radiant light it sheds on earth (Total Solar Irradiance). Friends of Science say that in fact, the more relevant scientific factor is the magnetic field of the sun that is projected by solar winds. Changes in solar magnetic flux directly impact the earth’s climate. As noted in the Friends of Science position paper on Doha, “The total energy emitted by the Sun varies only a fraction of a percent, but the solar magnetic field has increased nine fold from 1890 to 1990." This is but one cyclical factor of solar and cosmic activity that directly and indirectly affects earth’s climate, but the IPCC and its bevy of agenda-driven activists focus only on CO2. There is no substantial review of solar climate science. For 25 years the IPCC has projected frightening predictions of a baking hot, unlivable earth created by human use of fossil fuels and allegedly caused by rising carbon dioxide (CO2). A group of mostly retired earth and atmospheric scientists, professional engineers and geologists, Friends of Science has been reviewing peer-reviewed science on climate change for over a decade and their conclusion is that the sun is the main driver of climate change cycles.